Launched in 2001, West LegalEdcenter is the nation’s leading online continuing legal education (CLE) service from West, a Thomson Reuters business. The cost-effective source for online and in-person legal training and CLE, West LegalEdcenter keeps attorneys up to date on the law and compliant with state requirements. Find everything they need to manage continuing education and professional development in law firms and legal departments – live conferences and seminars around the nation, more than 7,000 online courses, compliance tracking, learning management, and full integration with in-house training. Taught by the most prestigious names in the legal field, West LegalEdcenter covers both the core substance of law as well as hot topics in every practice area. Here’s more pictures than you probably wanted of the Pasadena Doo Dah Parade. Some really good ones. Enjoy these pictures of the Doo Dah Parade 2011. Held in East Pasadena near San Gabriel and Colorado. Attendance is free and open to the whole family! Arrive early to find a good place to sit. If you can’t make it, be sure to check out their live stream at their website! Congratulations to the 2011 Queen Red Rosie and Grand Marshal Ron Stivers. Preparations are happening now for the 2011 Doo Dah Parade held in Pasadena. The parade starts at 11am and last about an hour or two, depending if there is any hiccup in the entries. There’s no program, but the curbs and sidewalks of East Pasadena will be jammed with spectators looking to catch a glimpse of some special moments in Pasadena parade history. Due to inventory and distribution challenges we have suspended direct-to-consumer shipping indefinitely. We apologize for any inconvenience this may cause. We received a quick response from Edward Carden, CEO and Co-Inventor of Golden Star Tea Co. regarding the the current availability and possible misinformation. I asked if it was ok to share the letter and it was not a problem, so I wanted to help get the word out about this great product. “Thanks for your note Victor, and thanks for the kind comments on your blog! of time, and also in some part to the antioxidant properties of white tea. expect the retail price of our larger 750mL bottle to drop a bit. Update 4-30-2011: As of today I visited the Whole Foods Market on Arroyo Parkway and they do not carry Golden Star Tea because of preservatives that are added. I was not aware that it had preservatives added. We have reached out to the company for an official response. Stand by. This past weekend I had an opportunity to try a Golden Star Tea Co. product. It was part of the Locavore event at Whole Foods and Cisco Home in Pasadena on Arroyo. I want to thank Rodney Powers for sampling at the Cisco the Jasmine Sparking Tea. Rodney works for Epic Wines a distributor of Golden Star Tea and other fine beverages. is a wholesale fine wine distributor operating on a statewide basis. With qualified sales professionals covering a majority of the California market, Epic Wines products can be found in over 4000 retail and restaurant establishments (and a few corner markets). What a great replacement for a non-alcoholic champagne option! Touch of sweetness, great taste. It was delicious and I can’t wait to get my hands on some more! Golden Star White Jasmine Sparkling Tea (non-alcoholic). 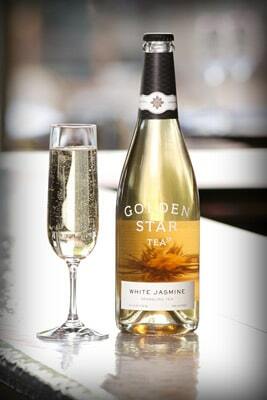 Golden Star White Jasmine Sparking Tea offers an experience unlike any other non-alcoholic beverage. The complex flavors and lingering tastes endeavor to satisfy the most discerning palate. A perfect accompaninment to any meal or occassion, it pairs well with a variety of foods and cuisines. At the Pasadena store on Arroyo, the bottles are upstairs by the deserts. Ingredients: an infusion of filtered water and organic silver needle jasmine tea, organic cane sugar. Golden Star’s White Jasmine Is First Sparkling Floral Tea. to meet consumers’ desire for sophisticated non-alcoholic beverages. at the 33rd annual Winter Fancy Food Show in San Diego. restaurants, resorts, and catered gatherings. anything the RTD tea market has seen before. taste both intricate and refreshing with complex flavor tones. foods,” says Golden Star’s CEO and Creative Director Eddie Carden. aroma of the beverage will benefit from a traditional presentation. food and beverage choices of the highest quality. offices are in San Francisco and Belmont, California. The requested URL /mail/… is too large to process. That’s all we know. There are six in American Idol contestants in Season 10. Who will be in the top 5? This is a huge milestone for the contestants where the top 6 becomes the top 5. Last night was the Carole King night. The 2011 Chili Cookoff and Classic Car Show! Annual Chili cook off and Classic car show. Family fun activities as well as music,food and beverages. Sanctioned by the International Chili Society. Enjoy some of the most fabulous cars in the world.Brought together by members of car clubs, collectors and celebs. Cast your vote to Crown the all new “Miss Chili/Conejo Valley. The all new VIP area will be air conditioned and will provide a comfortable environment to rest. This area is open to sponsors and VIP Ticketed guests. Our stage will feature music from the Spare Parts Band. Lots of entertainment and fun will be scheduled throughout the day. Do you like hot chili? It’s fun, it’s festive and it’s only one day a year! Join us for the 22nd anniversary of Museums of the Arroyo Day, where five museums located along the Arroyo Seco in Los Angeles and Pasadena open their doors free of charge from noon to 5 p.m. on May 15, 2011. Each year, thousands of Angelinos have experienced the diverse mix of art, architecture and history of the Arroyo Seco area found in the five unique history-based museums that preserve and perpetuate early Los Angeles life. The public can visit the MOTA museums during the day at no charge. This year’s MOTA Day theme is “Hats” and guests are encouraged to wear crazy, fashionable and sporty hats as they tour all five museums. This year, MOTA Day is sponsored by YELP, the online review website that 45 million people visit monthly. If you’ve been to MOTA Day in the past, you can let others know about your experiences here. As always, we expect great interest in MOTA Day, so visitors are advised to arrive early. We’ve added additional parking and you can easily use the Gold Line to get to MOTA Day, so click here for more information. The excitement has been building for months as many Houdini fans and those who love magic have anticipated the opening of the Houdini – Art of Magic at Skirball Cultural Center in Los Angeles. Today and every Thursday you can get in for FREE. Free Thursdays at Skirball and other cultural institutions around town, a great way to save some money and see some of the most amazing art and exhibits around. Skirball Center is centrally located off the 405 between the 10 and 101. I have two passes(each pass is good for two a $20 value) I will be giving away to those commenting below. Just leave a comment, perhaps something on your favorite magic trick. Who is your favorite magician? The Houdini Exhibit at Skirball runs April 28 to September 3, 2011. There are six current winners in American Idol Season 10? I have ordered the performances in the order I believe best down. In the meantime The Voice on NBC appears to be going strong with a rebroadcast during Idol of their first episode where contestants start to perform and the judges are turned with their backs to the performers as soon as the hear something they like they turn around indicated they want to work with the performer, if more than one spins, they judges compete to see who can convince the performer to work with them. In the meantime where’s Pia? Moderator: Raul Gordillo, PR Manager, Southern California Gas Co.
Join business editors and reporters from some of the most influential Southern California publications and TV stations. Learn about the latest business trends and insider tips to give you the competitive edge you need to win solid business media coverage. Continental breakfast will be served. Payment at the door: Checks encouraged; cash accepted. Consumers can borrow up to $2, 500 from First Choice Capital Resources to consolidate bills, take a vacation, or for any monetary needs! We are Extending the Early Bird Registration to Thursday, April 28th at Midnight! Registration will Still Include 1 Free Raffle ticket. You may also purchase additional raffle tickets online or at the event. Fabulous Raffle Prizes are Being Donated by our Wonderful “Real” Food Vendors and Speakers! * And Many More Prizes! Also, Wonderful and Delicious Foods will be Generously Sampled out to All Who Come, as it is, and has Always Been…. All About the FOOD! Click here to take you to the ‘Real’ Food Symposium Website! 2. Find cheap concert tickets! 4. CLICK FOR $15 COUPON DISCOUNT (Gift Card ID: momsday) – Expires May 8! Apple iPhone Location Tracking – Can you access? The story is very confusing coming from Apple. On one hand they say they don’t track, on the other they are releasing an update in coming weeks. The database is built and it is available. One update away from making it available to someone who really wants it. Some of you are wondering, well how do I get access to this data for my own personal use, is there an app I can use that tracks my movements? Does this change how you feel about owning and having geolocation services turned on? So Apple is releasing a patch? Apple Inc. (AAPL) defended the location information-gathering process it uses via the iPhone and unveiled a planned software update to scale back such practices. The company and Google Inc. (GOOG) have faced increased scrutiny for their practices involving the collection and storage of smartphone users’ location information. Last week, researchers found that Apple’s iPhones store unencrypted databases containing location information that sometimes stretch back several months. The Wall Street Journal has reported that iPhones, as well as smartphones operating on Google’s Android platform, regularly transmit their locations back to the respective companies. Apple said Wednesday it is not tracking the location to iPhones, has never done so and has no plans to ever do so. “Users are confused, partly because the creators of this new technology [including Apple] have not provided enough education about these issues to date,” the company said in a statement. Apple said it maintains a database of Wi-Fi hotspots and cell towers around users’ locations, a process that helps the phone calculate its location when such information is requested. The company downloads a subset, or cache, of the database on each phone. The cache is “protected but not encrypted,” and backed up on iTunes whenever users back up their iPhones, the company said. Apple said it would release an iPhone software update in the next few weeks that reduces the size of the database cached on the phone, ceases backing up the cache and deletes the cache entirely when location services is turned off. The statement came alongside announcements that the white iPhone 4 will be available Thursday, and that the second-generation iPad arrives in Japan, Hong Kong, and other new markets this week. Google Inc. (GOOG) last week defended its information location-gathering practices. U.S. lawmakers have invited representatives of the companies to attend a hearing on privacy next month following the claims they regularly track users locations and store data. Your search for delicious caramels is over once you have tried Le Bon Garcon caramels. Le Bon Garcon was at the recent Artisanal LA Spring Show in Santa Monica Place. Justin pictured with his helper at the Artisanal LA 2011 Spring Show. There are three flavors of caramels, which keeps things simple, Macadamia Nut, Mango-Passionfruit, and Salted and they are all very very good. Available as separately or as an assortment. Prices are $5 for 2oz, $10 for 4oz and $18 for 8oz. An assortment of all of our caramels–Macadamia Nut, Mango-Passionfruit, and Salted. In order to create the highest quality product possible, Le Bon Garçon uses only the best quality ingredients available and uses no preservatives. Le Bon Garçon uses Plugra butter in order to give its products the flavor and scent that is characteristic of high-quality European butter. Le Bon Garcon hand-makes, hand-stirs, and hand-wraps its caramels in order to achieve the best quality product. From start to finish, everything is prepared in the artisanal French manner. We hope you enjoy our caramels! 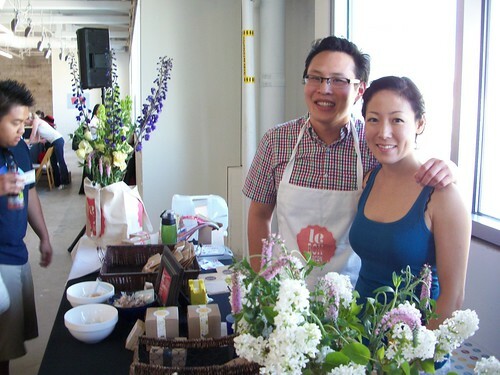 Justin studied architecture at the UC Berkeley College of Environmental Design which provided him with the design skills and the attention to detail needed to be a successful pastry chef. Always feeling more at home in front of the oven than the drafting table, Justin found himself drawn to a career in the culinary arts. Justin took pastry classes for fun, and studied abroad in Paris. Inspired by the culinary work of Parisian greats such as Pierre Hermé and Gerard Mulot, Justin decided to take the leap as a pastry chef.